This is the second in a series of three posts on letter learning taken from the Letter Buddies Teacher's guide by Libby Larrabee. Check back later this week for the next post in this series! You can read the earlier post here! Letter Buddies Alphabet Books are great resources that encourage young children to begin learning the alphabet. The large- format, lap-book size (12” x 16”) encourages conversation and interaction by all children in a whole- or small-group setting. During alphabet book sharing, children can learn about letter features, letter names, and letter sounds. The large letters in the corner of each page allow for easy letter-formation demonstrations. Each Alphabet Book focuses on an environment that is common to a child’s world: home, school, and store. Encourage children to talk about their experiences in each place, using the vocabulary from these books as much as possible. This will promote greater comprehension and retention of new words and skills. Your conversation during Alphabet Book sharing is critical. This is the perfect time to encourage oral language development. Explicit talk and questioning about each book will encourage children to make connections to their own experiences and become involved in the reading. This is the time to explain unfamiliar concepts and teach new vocabulary. -Talk about the features of the lowercase and uppercase versions of each letter. -Name the letters and give students practice naming the letters. -Talk about how certain letters are grouped together to form a word. Explain that there is a word under each picture naming what the object is. -Show that the letter at the top of the page is the same as the first letter in the word below. -Demonstrate and practice alphabetical order using the picture glossary. -Engage in storytelling and conversation while playing the I-Spy game included. -Finger-trace the letters to demonstrate formation using verbal directions from the Child Talk Table (see below). For more ideas, be sure to check out the suggested activities provided at the end of each Alphabet Book! Add to your collection! Have your students create a class alphabet book (or try it individually). Start the year with a large, empty book with at least one blank page per letter. Each time you have a read-aloud, ask the children to identify 2 or 3 items from the story to be placed in the class alphabet book. Alphabet books can also be used to teach initial sounds. Each page of the alphabet books uses a letter to introduce something with the corresponding beginning sound. The items introduced will be familiar to children from the context of home, school, or store. To further help children learn the correspondence between letters and initial sounds, we have included a free 23-page downloadable set of initial-sound worksheets at the bottom of the page. 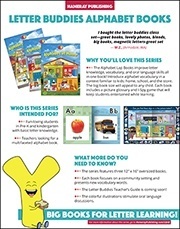 Learn about our Letter Buddies line of letter-learning products for early childhood by clicking here to visit our website or clicking the image to the left below to download information sheet on Letter Buddies Alphabet Books for letter learning! To download the free worksheets, click the image to the right.